We recently surveyed long-term Dataquest students (n = 766) to get reviews of our platform and to see if they were getting the career outcomes they wanted. Check out the infographic below to see what we found in our survey in visual form, or scroll down to read about it in more detail. Students told us that improving their career was a big motivator for studying data science. 81% of respondents said they came to Dataquest with some hopes of career improvement—just 48% were looking to switch careers, and an additional 32% were looking to learn skills that would help with their current job. The vast majority of students, it seems, have come away feeling like they got what they wanted. A whopping 96% of students said they would recommend Dataquest to someone looking to improve their career opportunities. 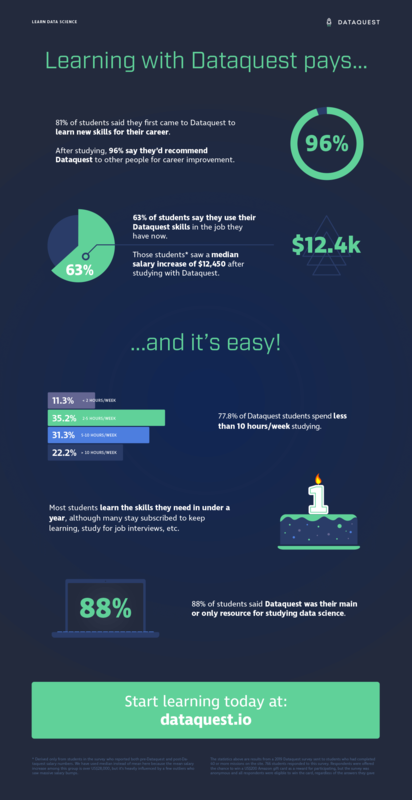 And 62.5% of students said they were using the skills they learned at Dataquest in their current job. Our data also suggest that those skills pay. Among that 62.5%—the students who are currently using their Dataquest skills at work—respondents saw a median pay increase of $12,450 when comparing their salary before starting Dataquest to their current salary. 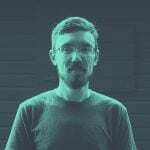 Learning Data Science is Easy! Well, maybe not easy—learning data science is definitely hard work! But learning with Dataquest doesn’t have to destroy your schedule: 77.8% of students said they spent less than 10 hours per week studying. It’s still hard work—only 11% of students studied for just two hours a week or less—but 5-10 hours a week is something even full-time students and employees can generally fit into their schedules. Most students said they reached their initial study goals in just 2-6 months, although many remained subscribed so that they could keep adding new skills and to study for interviews and continue practicing using the platform. Part of the reason students were able to progress so quickly may be that they didn’t have to go looking elsewhere for help or supplementary learning resources. 88% of students said that Dataquest was the primary or only platform they used to study data science. Can Dataquest help you get a job? Absolutely. You’ll need to commit to the program and put the time in, but it works. Dataquest can help you just like it’s helped a lot of other students improve their careers and work toward data science dreams. You don’t have to take our word for it. Check out our student reviews on online course review sites like Switchup or Course Report or G2 Crowd or anywhere else students review Dataquest, and you’ll find a lot of happy learners. Sign up for our free courses and check out our free data science career guide to start your own data science journey today!